Published: Oct. 15, 2017 at 03:43 p.m.
San Francisco 49ers linebacker Ray Ray Armstrong strip fumbles Vernon Davis and it's recovered by Jimmie Ward who takes the ball all the way back to the 1-yard line. Published: Dec. 11, 2016 at 04:13 p.m.
San Francisco 49ers cornerback Jimmie Ward intercepts New York Jets QB Bryce Petty. 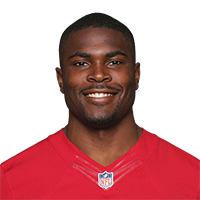 Published: Dec. 4, 2016 at 02:05 p.m.
Chicago Bears wide receiver Deonte Thompson fumbles, San Francisco 49ers running back Shaun Draughn recovers. Published: Dec. 6, 2015 at 07:32 p.m.
Chicago Bears quarterback Jay Cutler audibles at the line before throwing an interception to San Francisco 49ers defensive back Jimmie Ward, who returned it 29 yards for a touchdown.